We continually hear from our clients, heavily regulated financial institutions, about the incredible cost of compliance and how it slows their marketing and sales efforts. The sales and marketing teams want to do things quickly to promote their services, but they are continually slowed down by their compliance departments. How can you build better relationships across departments, increase speed-to-market and ensure your organization stays compliant? One of the biggest challenges lenders face is co-marketing. Co-marketing is seen as one of the most effective ways to drive growth – as long as it is done right. The primary concern regulators have when a mortgage loan officer (MLO) is co-marketing with a Realtor, brokerage operation, home builder, etc. is that the consumer looks to these other parties for advice and guidance, and your co-marketing with them may look like an endorsement of your services to the consumer. However, an endorsement is a referral, and you cannot pay for a referral, which can make co-marketing problematic. First, and easiest, make sure it is clear to the consumer that your co-marketing activities are advertising – and mark your materials as such. Second, pay for only your portion of the ad. RESPA (Real Estate Settlement Procedures Act) requires that each co-marketing partner pay no more than and no less than, their fair share of costs when marketing their services together. To satisfy RESPA requirements and help mitigate risk, lenders must have a consistent, defined method for properly documenting how they calculated the pro rata shares for all marketing materials, and how percentages of total costs are assigned to, and paid by, each co-marketer. Mitch Kider, Managing Partner at Weiner, Brodsky, Kider PC says, "You have to literally get to the point, as arcane as it may be, of paying on a pixel-basis." As lenders move into true lender-Realtor co-marketing, a few common co-marketing pitfalls have surfaced. 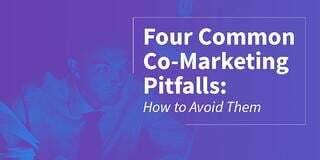 Read our definitive Guide to Co-Marketing to learn about the four common co-marketing pitfalls mortgage lenders face and how your organization can avoid them. Now You're Co-Marketing... What About the Leads? An MLO in your organization is co-marketing with a Realtor and leads are coming in, but who owns those leads? Kider says the real question is who does the consumer think they're giving their information to and what do they think is going to happen with that information? Thoroughly document your compliance practices, train your organization and live these practices every day. Auditors expect you to be able to quickly deliver the advertisements, marketing programs, scripts and other marketing materials that they request – typically within five days or sooner. Laws require that you maintain these materials and that they be easily and quickly accessible to auditors. Ensure you have your marketing materials in a centralized repository so they can be easily given to regulators. Co-marketing is a great opportunity for MLOs to quickly grow their pipeline, but it needs to be done within specific guardrails. Marketing, compliance and sales leadership can help define these guardrails and set the MLO up for success, but if you fail to lay out clear expectations, the consequences could be dire.